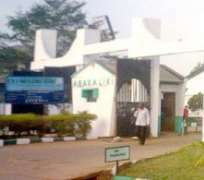 The Chief Medical Director, Federal Teaching Hospital Abakaliki, Ebonyi state,, Dr. Emeka Onwe Ogah has appealed to the Medicins San's Frontiers known as Doctors without border from Rome to assist the hospital with utility vehicles for aggressive sensitization of lassa fever in the rural areas within the state. Dr Ogah who disclosed that the sensitization when embarked on, will reduce the high level outbreak of the deadly disease in the state made the appeal when the operations coordinator from Rome Dr. Siefano Argbneiano paid a courtesy visit to the hospital management and to inspect the project ongoing within the hospital premises. Appreciating the group who has contributed meaningfully in providing consumables, drugs and training of staff free from contacting the disease while discharging their duties, urged other institutions to join NSF and NCDC etc in the fight against Lassa fever outbreak in the state and country at large. "The construction going on was due to small size of the emergency rooms which will be difficult to manage lassa fever and other issues and this construction going on, will serve as a saving area for the management of the patients".
" it is no longer the time a suspected case is abandoned as people will be there 24hours with immediate care for the patients because MSF has been keeping to their own words and that is why I am assuring them collaboration beyond their expectation" . He called on the Ebonyians to avoid eating rat, exposing their foods and keeping their environments dirty stressing that Lassa fever is easily contacted through such means. "People should also stop eating rats because of the deadly diseases that can be contacted through it. Keep our environment clean and avoid leaving our foods open to reduce the lassa fever out break." "Lassa fever is endemic in Ebonyi state, when you have fever don't always say is malaria, small typhoid, or any other illness if you take first aid and the fever is not going down rush down to teaching hospital for diagnosis. Meanwhile the CEO from Rome Dr.Siefano Argbneiano assured the chief medical director of their support to ensure that healthcare challenges among health workers in Nigeria andAfrican is eliminated through committment and collaboration. Earlier, Dr Maikere Jacob, Country Medical Coordinator (MSF) stated that their mission is to make sure that any patient coming to the hospital from the entry gate is screened, isolated if suspected, and ensure a normal and quick analysis of the patients is done before directing them to the virology unit where their will receive their treatment free of charge . He added that they will supervise the laboratory to ensure that all analysis are done in one place as lassa fever is not known completely. He then urged the NCDC and others to join hands in making sure that the health workers are not infected when discharging their duties .